Moisture Manager has proven to be beneficial in conserving & reducing water and helping our lawns survive on 1/3 less water than normally would be applied. The reduction in water comes by reducing the watering days and not the time. Deep watering is beneficial and cutting back the length of time does not provide the deep water penetration that is necessary for maximum benefit of your Moisture Manager treatment. For example, if you are watering 3 days a week, you may cut back to 2 days (33 % or 1/3) reduction. If you are watering 4 days a week, you may cut back to 3 days (25% or 1 / 4) reduction in water use. 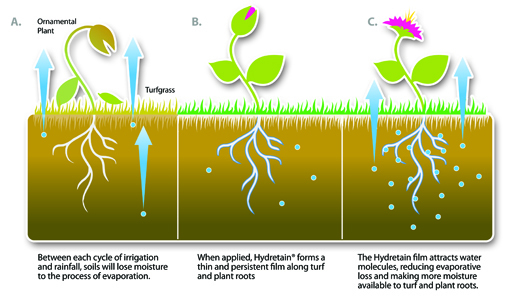 Moisture Manager treatments should be re-applied every 90 days to maintain maximum water saving benefits. Green Pointe Moisture Manager treatments insure each application is applied evenly across the entire lawn at the correct rate to maximize water savings.